“Life, Animated” (2016). Cast: Owen Suskind, Ron Suskind, Cornelia Suskind, Walt Suskind, Gilbert Gottfried, Jonathan Freeman, Emily Jathas. Director: Roger Ross Williams. Screenplay: Ron Suskind. Book: Ron Suskind, Life, Animated: A Story of Sidekicks, Heroes and Autism. Web site. Trailer. When Owen Suskind went silent at age three, his parents, Cornelia and Pulitzer Prize-winning journalist Ron Suskind, were shocked. Having been a vibrant, engaged toddler, Owen suddenly withdrew, uttering few sounds except for occasional gibberish. Needless to say, Ron and Cornelia wondered, how could this happen? Not long thereafter, Owen was diagnosed with regressive autism. His parents did their best to care for him, though little seemed to help. However, the one thing that appeared to make a difference was showing Owen videos of Disney’s animated movies. Those pictures gave Owen joy before he went silent, and they seemed to spark something in him after his diagnosis. But what? Over time, it became apparent that Owen had internally memorized the dialogue from all the Disney films he watched. And, years later, when Owen again began to utter fragments of phrases and sentences, it became obvious that he was using the Disney material as a filter for processing his understanding of the world. This realization unlocked the mystery of Owen’s “disappearance” – and provided the key to help his parents reach out to him once again. With special guidance and counseling, Owen gradually became less withdrawn, emerging from his silence and re-engaging with others. And, as the film shows, he even took big steps toward becoming a highly functioning, independent adult, all thanks to the colorful characters first introduced to him through his beloved cartoons. 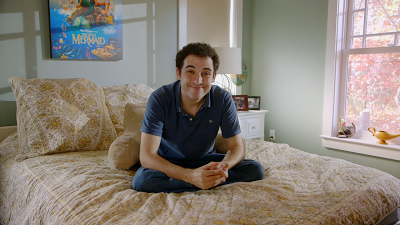 Autistic adult Owen Suskind finds a unique way to reconnect with the world in the inspiring new documentary, “Life, Animated.” Photo courtesy of The Orchard. Based on Ron Suskind’s best-selling book Life, Animated: A Story of Sidekicks, Heroes and Autism, the documentary chronicles Owen’s personal history, intercut with segments profiling his efforts at becoming a self-sufficient 23-year-old. It features heartfelt interviews with its subject, his parents, his older brother Walt, his counselors, his girlfriend Emily and two of Owen’s favorite Disney voiceover artists, Gilbert Gottfried and Jonathan Freeman. The film also incorporates clips from many of Disney’s animated classics, including “Aladdin” (1992), “The Little Mermaid” (1989), “Beauty and the Beast” (1991), “The Lion King” (1994), “The Jungle Book” (1967), “Peter Pan” (1953), “Pinocchio” (1940), “Bambi” (1942) and “The Hunchback of Notre Dame” (1996). Owen’s perseverance to make a comeback is truly inspiring, not only for the progress he has made, but also for the ingenuity he exercised in getting there. Even though he remained silent through much of his re-emergence process, the wheels of his mind were undoubtedly spinning the entire time. His condition limited his options regarding the tactics he could use, so he had to get creative, and, in doing so, he had to believe on some level that his solution was going to work. That attitude epitomizes what the conscious creation process is all about, the means by which we manifest the reality we experience through our thoughts, beliefs and intents. Owen’s fascination with the Disney animated films gave him the key he needed. By using them as a sort of Rosetta Stone for understanding the world around him, he found a unique way to relate to his environment. Interestingly, as his father discovered through some drawings Owen made, the young man had a particular attraction to the sidekick characters in the movies, such as the squawky parrot Jafar from “Aladdin.” This preoccupation became so pronounced that Owen even came to see himself as the protector of the sidekicks, the characters who were always present but resided in the shadows of their heroic counterparts. By assuming this role, Owen thus found a purpose for his life, one that allowed him to benefit both himself and others similarly situated. Upon his re-emergence, Owen actually began taking the lead in his dealings with his peers, forming a Disney video club for others with special needs. He became downright gregarious, a drastic departure from the silence of his childhood. He also began writing a book detailing his experience as the protector of the sidekicks. That’s quite a rebound for someone who was once thought irretrievably lost. Thankfully, Owen believed in himself and his ability to overcome his challenges. His experience thus serves as a tremendous example to those around him – and to those of us in the viewing audience. Director Roger Ross Williams has created a candid, intimate and engaging biography of a remarkable young man challenged to find a way to reconnect with the world at a time when all seemed lost. This enlightening and informative documentary will change your mind about what’s feasible, shedding light on inventive ways to tackle problems that are seemingly unsolvable. With an acute eye toward avoiding sentimentality, “Life, Animated” keeps things real and does so with integrity and a great sense of style, especially in its original animation depicting Owen’s personal experience. This highly recommended offering may well provide the inspiration for those looking to see possibilities where none are thought to exist. The next time you’re tempted to give up on life, consider the incredible odyssey of Owen Suskind. He shows us more about life in 90 minutes than many people experience in decades of existence – and he does so all for the joy of being able to connect with everything it has to offer.